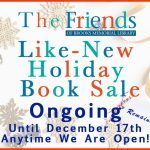 Monday, December 17th from 10 am – 2 pm is the last day of our Like-New Holiday Remainder Book Sale, and EVERYTHING is $1! 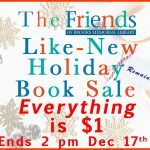 This is it, the last day of our Holiday Book Sale! Until any leftover books, CDs and DVDs are packed away on Monday afternoon, EVERYTHING IS $1!!! 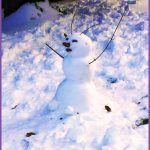 Like-New Holiday Remainder Book Sale: Prices Marked Down! The Like-New Holiday Remainder Book Sale will continue until December 16th, with all prices REDUCED! 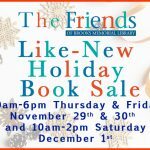 Like-New Holiday Book Sale @ Brooks Memorial Library! 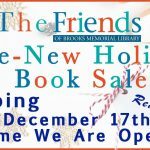 The Friends of Brooks Memorial Library will be holding the 13th Annual Like-New Holiday Books Sale from November 29th through December 1st! 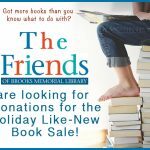 Come on in and browse from the excellent selection of fiction, non-fiction, Kids books, CDs, and DVDs, and say hello to these hard-working library fundraisers 🙂 The Friends will be there from 10 am-6pm on Thursday and Friday, November 29th and 30th, and from 10 am-2pm on Saturday. Can’t make it in then? No worries! the Book Sale is ongoing, and you may pay for your purchases at the Circulation Desk until we are closed. 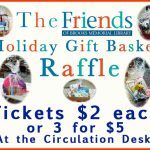 There will ALSO be a holiday gift basket raffle ongoing until the drawing is held on December 16th. Tickets may be purchased at the Books Sale, or at the Circulation Desk any time we are open. Join us at 7 pm, on Friday, October 19th, as the Friends of Brooks Memorial Library present Jazz & Blues singer Samirah Evans and the diverse vocals of Evelyn Harris for an evening of dynamic music! They will be stylishly accompanied by the accomplished guitarist Joe Belmont and well-known bassist Wayne Roberts. 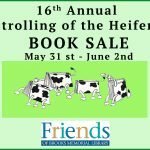 Friends Books Sale Continues: Thank You! 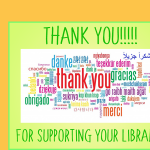 Thanks to all who made the first few days of the Friends of Brooks Memorial Library Summer Book Sale a great success! The sale will continue until Saturday, June 15th at 3 pm. All proceeds support events, technology and other resources, like Lynda.com. Please pay for your books at the desk! 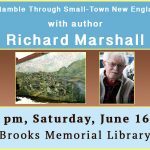 Join us on Saturday, June 16th at 2 pm for an author reading and discussion of A Ramble Through Small-Town New England: Volume One, by Richard Marshall. Read his statement below for more information! The idea of writing a book about towns along the southern New England border came while sitting on my deck in Whitingham on a beautiful sunny day. I was looking at a Vermont map and saw all the towns stretching from Brattleboro to Bennington. Why not go to each town, meet the people there and write about my impressions of what I saw and heard and, where possible, have people write their own stories? I interviewed artists, farmers, store owners, entrepreneurs, factory owners and many others. 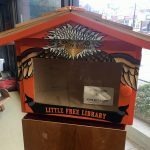 Enter now for your chance to win a Little Free Library for your neighborhood! Tickets are $5 each, and may be purchased at the library circulation desk. The winner’s name will be drawn on June 2nd! Join us at Brooks Memorial Library on Wednesday, May 23rd at 7 pm as local author, poet, performer, businesswoman and community organizer Naima K. Wade reads selections from her first Chapbook, War is Over We Are Unbound. She will also share selections from her memoir, Elbow Dreams: Growing Up in Vermont During The Turbulent Late 1960’s. On Saturday, May 19th at 2 pm, the Friends of Brooks Memorial Library proudly presents a reading of The Full Vermonty: Vermont in the Age of Trump, co-authored and read by syndicated political cartoonist, Jeff Danziger. Co-written with Bill Mares, it features writings from a host of local contributors who give their take on current themes of life in Vermont. 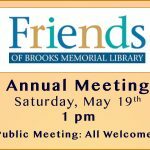 The public is invited to attend the Annual Meeting of the Friends of Brooks Memorial Library on Saturday, May 19, at 1:00pm. The meeting will be held in the meeting room on the top floor of the library next to the Children’s Room. 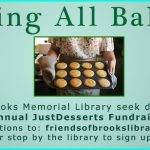 The Friends of the Library are the main fundraisers for Brooks, and support many of our free, public events as well as our publicly accessible technology. 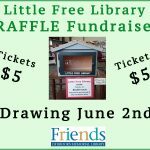 There are now only two “Little Free Libraries” remaining for sale and one to be raffled to benefit the Friends of Brooks Memorial Library. The libraries are all hand-built by the Brattleboro Rotary Club’s Literacy Project Committee and painted by local artists Robert Craig Aldrich, Bob Cincotta, Pat Little, John McCarthy, Susan Rosano, Kim Stice and Suzy Worden. 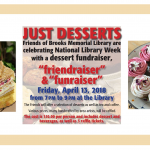 The Friends of Brooks Memorial Library will celebrate National Library Week (April 8 to April 14) with a dessert fundraiser and “Friendraiser” on Friday, April 13, 2018 from 7pm to 9pm at the Brooks Memorial Library. The Friends will offer a selection of desserts, as well as tea and coffee. Various prizes, many handcrafted by area artists, will be raffled off. The cost is $10.00 per person and includes dessert and coffee as well as 3 raffle tickets. You may also purchase extra tickets — 3 for $5.